Wind Capital Group, which has developed a number of wind farms, recently made a change in their business model and is now developing-and owning-wind farms. Their first owned project is the 150 MW Lost Creek project in northwest Missouri. The U.S. electrical power industry is currently making a transition, as it incorporates more wind and solar power into its traditional mix of natural gas and coal-fired power generation facilities. Some of the companies building the power facilities and supplying that power are also going through some transitions. Missouri-based Wind Capital Group is an example. Over the last half-dozen years, Wind Capital Group has successfully developed a number of wind power projects in the U.S. Midwest. But the company recently made a shift in their business approach and is now developing-and owning-wind farms. "That's going to be the business model going forward," explains Dean Baumgardner, executive vice president - Technical Services and Construction, Wind Capital Group. "There are many wind farm developers out there, and that is one business model. But we want to build an asset for the long term and to do that, you have to have ownership-and we brought in financing partners to make that possible." Company founder Tom Carnahan and Baumgardner made the decision a few years ago to grow the business of Wind Capital Group, through both owning and operating wind farms. "We spent the better part of a year looking for the right financial partner, and we considered many options, from investment firms on Wall Street to private equity funds," explained Baumgardner. When they met with NTR plc, "things just clicked". Based in Ireland, NTR has plenty of background in the wind business. The principals behind the firm started Airtricity North America and sold it to E.ON Climate & Renewables in 2007. But they wanted to get back into the U.S. wind market. "They've been a great partner to have-they add value, but they leave the day-to-day business to Wind Capital management," says Baumgardner. Having access to capital through NTR has truly brought benefits for the Wind Capital Group, especially since capital markets have tightened over the last two years, due to the financial crisis. The first project that Wind Capital Group has developed and owned is the recently completed 150 MW Lost Creek project, in northwest Missouri. The region is familiar territory for the company-it built the 57 MW Bluegrass Ridge Wind Farm in 2007, the first utility-scale wind energy generation facility in the state. "Soon after we started the Bluegrass Ridge project, we started looking around the same area and we found a site just to the south, in DeKalb County, that we thought would be viable for another wind farm." There was a good level of interest in, and support for, a wind power project in the county. Wind Capital Group started putting up met towers and working on leases with the landowners. "We knew there was a good wind resource there," says Baumgardner. "The winds in northwest Missouri may not be as strong as farther west in Kansas and Nebraska, but it's a good steady wind resource in the seven to eight meters per second range, which makes for a very viable wind farm." 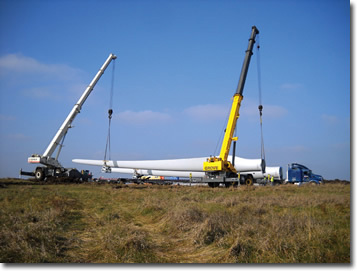 Considering the site and its wind resource, they opted for GE XLE 1.5 MW turbines. Northwest Missouri is well served transportation-wise, and there were a number of different interstate highway access points for the Lost Creek wind power site, for delivery of more than 900 oversized truckloads of equipment. But once you're off the interstate, well, it's a different story. "Within the Lost Creek project area, we were dealing with county roads that weren't designed for the weight and size of the wind farm components-some of them no more than a dirt farm path," says Baumgardner. In addition to rebuilding five miles of county roads, they did extensive upgrades, including bridge and culvert work, and they widened a number of turning radiuses to accommodate the over-sized loads on the trucks. Baumgardner noted that Wind Capital Group worked closely with the Missouri Department of Transportation on site access, road permits, and rebuilding of bridges. "We engaged the government agencies early and kept them informed, and that worked well for all parties." 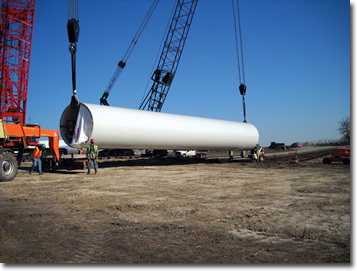 Northwest Missouri is well served transportation-wise, and there were a number of different interstate highway access points for the Lost Creek wind power site, for delivery of more than 900 oversized truckloads of equipment. But some county roads linking to the site had to be rebuilt to accommodate the over-sized loads. The schedule called for construction work on the access roads to be started by the summer of 2009, carrying on into the fall. The fall also saw crews doing foundation work for the turbines. Since they were pouring 300 cubic yards of concrete for each of the 100 turbine foundations, they had two concrete batch plants on site. "We had a lot of concrete to move-and for the foundations, they needed to be continuous concrete pours. As the foundations were completed, we started bringing in the turbine components and staging them at each foundation, so we only had to handle the equipment once." The schedule was flexible, to accommodate things that weren't scheduled, explains Baumgardner. Component deliveries, for example, often don't happen exactly as planned. "If more trucks showed up than scheduled, we had a place for the trucks to stay overnight, if needed. You have to be realistic-you can only offload so many trucks per day." The erection of the turbines started in the fall and carried on through the early winter. The crews on the Lost Creek project had one weather element not present on a lot of wind power construction projects: lightning. "We had extensive lightning during the fall, when we were first putting up the turbines," says Baumgardner. They had a work site protocol of everyone standing down if lightning was observed within 20 miles of the site. It proved to be a prudent move. The erection crane was, indeed, hit by lightning. "It did some damage to some of the electronics on the crane, but thankfully no one was injured because no one was on the crane." Wet weather both during the fall of 2009 and the spring of 2010 presented challenges, notably when they were trying to do road work and site restoration. Predictably, for this area of the country, they had a cold winter. But that brought some benefits. "It made for better crane walks for us-we were able to move the crane from one turbine site to another easier with the frozen ground." The development team at Wind Capital Group was familiar with the geography of the Lost Creek site, having built the Bluegrass wind project nearby. Northwest Missouri, where the Lost Creek project is located, is mostly rolling hills. This very much dictated their site layout in that the turbine locations generally followed the ridgelines. "With this kind of geography, it spreads your project out versus building a wind farm on a flat windy site in the Great Plains, for example," explains Baumgardner. "So we have a 30-square-mile site for a 150 MW plant. "We originally planned the project for 200 MW and have sufficient land for 200 MW, but our off-taker was interested in 150 MW at the time, so we scaled it back." They sized the substation and transmission for the additional 50 MW and are ready to develop the additional renewable energy if, and when, it is needed by the utilities. At 150 MW, Lost Creek is already the largest wind farm in the state. Baumgardner reports that the State of Missouri was very accommodating and supportive of the wind power project. He noted that in 2008, a large majority of Missouri voters-66 percent-voted in favor of Proposition C, a clean energy initiative. The initiative created a Renewable Electricity Standard for Missouri, requiring utility companies to gradually increase their use of renewable energy, so that by 2021, at least 15 percent of the power used in the state comes from renewable sources. "Missouri has been a very encouraging state for wind power," says Baumgardner. "And with the Lost Creek project, local people wanted wind power. They understand that it brings jobs, a new tax base, and new sources of revenue. So we received a lot of cooperation." Illustrating its impact, the $300 million Lost Creek project was said to be the largest private sector investment in the state of Missouri this year. Though local cooperation was good, Wind Capital still dealt with some 80 farmers for leases and on the overall project. "Getting 80 farmers on the same page is no small challenge, but we got there," says Baumgardner. "We met individually with the farmers, and we also did periodic group meetings so they all had the same information, and they could all ask questions." One of the key messages they reinforced at the meetings is that Lost Creek would indeed be a heavy construction site, that there would be a lot of traffic during construction, and the importance of safety, both for the construction workers and for the farmers. Wind Capital Group's approach was to use their own employees-rather than land agents-to deal with the farmers. These people are often from the local community, so they are known and respected. "It could still take multiple times sitting down at the kitchen table and having a coffee, to explain the wind project," says Baumgardner. "But we told everybody that when it came down to doing the micro-siting of the turbines out in the field, they could accompany us, and we would show them exactly where we were going to put the turbine. And if they wanted it moved, we would try to accommodate that. And often we can do that." It might just mean moving the site 50 feet to better accommodate farm operations. The company also worked closely with the U.S. Wildlife Service and Missouri Department of Natural Resources on extensive environmental and avian studies. Bat studies determined that the site is an Indiana Bat habitat area, though they did not see any of the bats during the construction period. "We adjusted our construction plans to avoid the forested areas that are conducive to Indiana Bat habitats, and we also voluntarily put a one-mile setback around a small lake." In terms of connecting to the grid, the company worked with the transmission system owner in the region, NW Electric Power Cooperative, Inc. NW Electric is a member of Associated Electric Cooperative Inc., which is buying the power from Lost Creek under a 20-year Power Purchase Agreement. Wind Capital Group and NW Electric worked together to build a new wind farm substation and an eight mile, 161 kV transmission line into the project area. Baumgardner noted that they received good cooperation from local landowners on easements for the line. Serving as the general contractor for Wind Capital Group and carrying out construction on the entire project was RMT Inc., an experienced wind farm builder. "They also had a very good safety record, which was important to us," says Baumgardner. As mentioned, Lost Creek was, and is, a significant project for the Wind Capital Group, in that this is the first time the company is the developer/owner and operator of a wind farm. They had previously partnered with other companies, carrying out the development role. Wind Capital has done four other wind farms in northwest Missouri, all in partnership with John Deere Wind. "Lost Creek is a new approach for us, where we have stayed in control of the wind farm project. We're building the relationships with the communities and the landowners, letting them know we are going to be there for the long term, as the owner of the wind farm." Making the transition to being an owner and operator has meant some staff capacity building on the part of Wind Capital Group. "We have built up our experience internally, and we will continue to look at how we can do things better going forward. That's a natural part of the process," says Baumgardner. They seem to be off to a fine start-the Lost Creek project came in ahead of schedule and under budget. Baumgardner is confident about the future for wind power, despite some challenges ahead. Wind Capital dealt with some 80 farmers for leases and on the overall Lost Creek project. The company worked closely with farmers and sometimes changed the location of a turbine's site, to better accommodate farm operations. "We are bullish on renewable energy-we know the U.S. needs it. We need it for the environment, we need it to create jobs, and we need it for national security. But the economic downturn has been a setback for the industry." The utility companies right now don't have big energy demands, so they do not need new sources of energy. They know they need to add renewables in the future, especially if Congress creates a strong energy policy that includes a National Electricity Standard. "It's hard to get a fire lit under utilities right now, but we are hanging in there for the long term," says Baumgardner. "We are talking with a number of utilities and are getting close to signing some new Power Purchase Agreements that will allow us to move forward with construction." There are a number of big picture factors working in favor of renewable energy, he says. Natural gas prices may be low now, but they can be volatile. Coal powered plants are aging, as are nuclear power plants. These types of projects may be replaced, but both coal and nuclear require extremely long lead times. Wind projects can be built in a fraction of the time, Baumgardner notes. "Right now, our message to utilities is this is the time to lock in your renewable power. Turbine pricing is great-we haven't had this kind of turbine pricing in years. Contractors are hungry, and they are giving good pricing. And commodity prices are low. "Now is the time for utilities to build. They can lock in their capital cost, and their fuel is free for the future." And, he adds, there is so much potential for renewable energy. "So far, we've only scratched the surface of what we can do in renewable power in America."